Hello! I hope you had a lovely weekend. We had our first real measurable snow this weekend and I couldn’t have been more excited to be snowed in with my family. Today is one of those magical days that school aged children across the metro pray for. A SNOW DAY! It is after breakfast and the kiddos are all still in their PJs. What’s the rush, right? Frankly, I think there should be at least one snow day a week during the winter months. 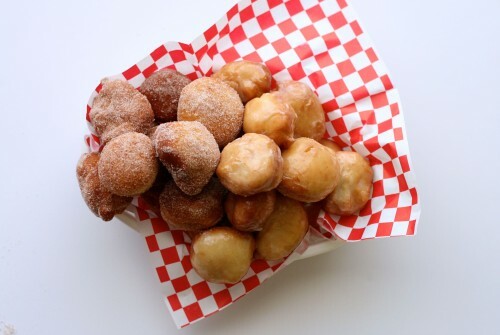 One day during the week that you can stay in your PJs til noon and stuff yourselves with hot fresh doughnuts. Wouldn’t you agree? Which kind of doughnuts would you chose to stuff yourself with? There are so many options! I love a variety of doughnuts but I think dough holes would win. The temptation to make all doughnut holes was so strong. They are just so stinking cute and “pop” so easily into my mouth. 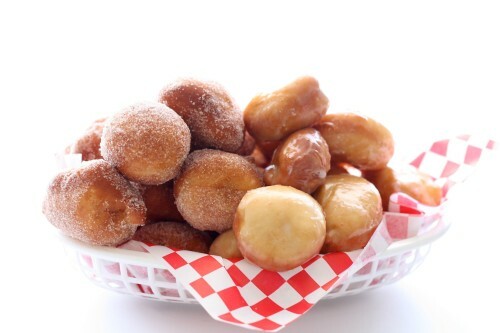 The doughnut holes I kept simple by tossing half with a cinnamon + sugar blend and the other half in a powdered sugar glaze. Homemade doughnuts certainly falls in the “everything in moderation” category. It had been almost 7 years (6 years, 11 months) since I made these. Crazy right? Seven years ago I was living in a different state and had only two children (an almost 2 year old, and a 3 month old). It was time to revisit this recipe. Last time around I did a simple powdered sugar glaze and a chocolate glaze. This time I wanted to do something a little more grown up. Of course I kept the chocolate glaze because, come on, you never grow too old for chocolate glaze and sprinkles. This was my first time making filled doughnuts. Everyone in my family loves the filled doughnuts from the doughnut shop so I thought I would give it a try at home. Cream filled and chocolate glaze doughnuts were made for Alex and the kiddos. 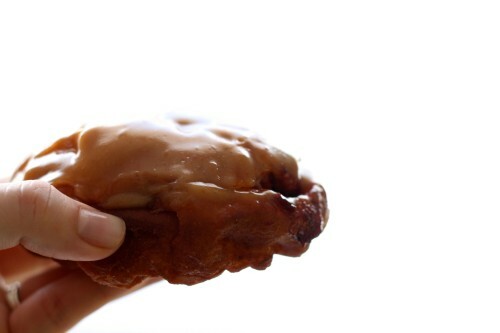 That is something pretty traditionally found in doughnut shops across the country. The best part of making these at home is that you can filled them with whatever your little heart desires. On that day my heart desired homemade jam and a peanut butter glaze. PB&J DOUGHNUTS! This needs to be a thing! Of course I had to make a donut homage to Homer Simpson. 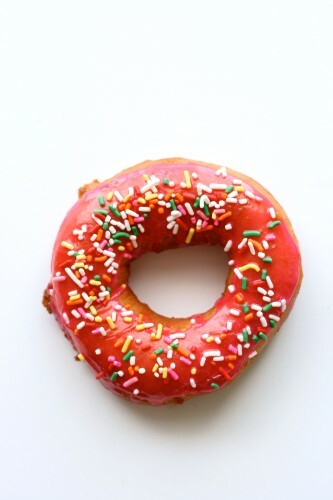 A pink glazed doughnut with sprinkles. These would be perfect for a Valentine’s Day breakfast *wink wink*. 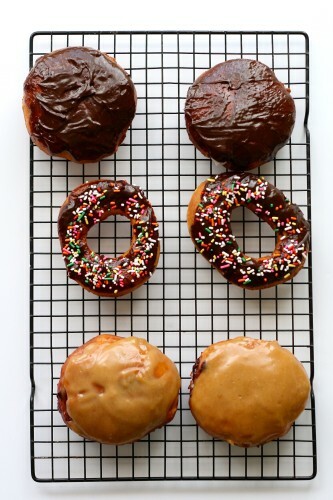 The recipe for these doughnuts is Alton Brown’s Yeast Doughnuts. 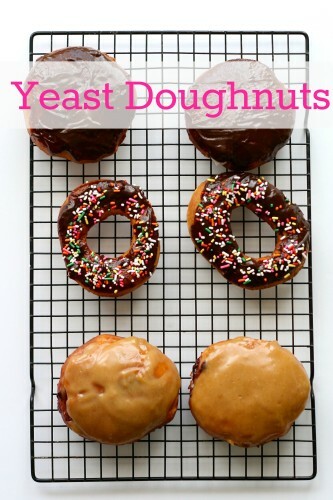 My opinion is this is a very approachable recipe for a first time doughnut maker. The dough is really soft and easy to roll out. Since the dough itself isn’t sweet they work well for filling and glazing. This time around I left out the nutmeg since I didn’t have any and I really didn’t miss it. The doughnuts are best served warm. They become more bread-like once they cool completely. 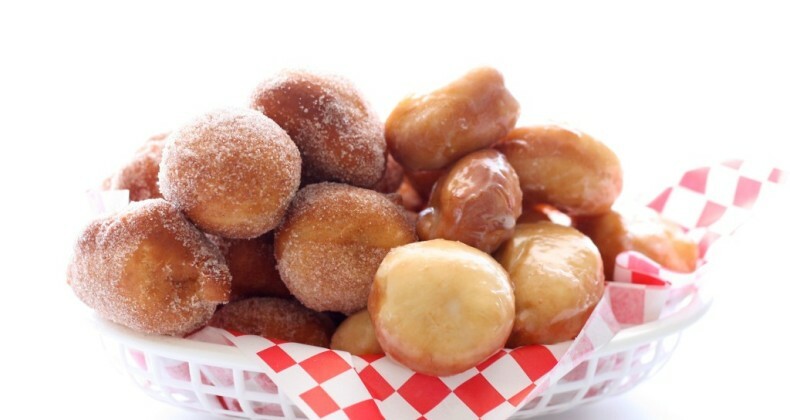 Preheat the oil in a deep fryer or Dutch oven to 365 degrees F. Gently place the doughnuts into the oil, 3 to 4 at a time. Cook for 1 minute per side. Transfer to a cooling rack placed in baking pan. Combine milk and vanilla in a medium bowl. Sift confectionersâ sugar into milk mixture. Whisk slowly, until well combined. In a medium bowl melt chocolate in the microwave in 30 second increments until smooth. Stir in milk. 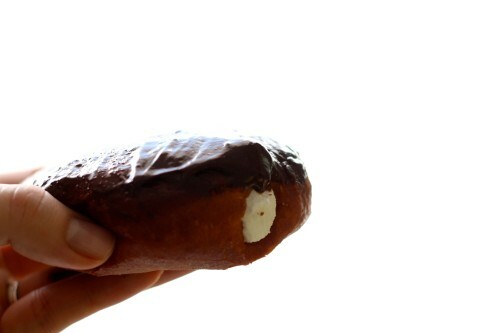 Transfer to a piping bag, using either a filling tip or a large round tip insert into the side of the doughnut and fill the middle until solid. PB & J donuts sound amaaazing!! I’d love to try those! I think they seriously need to be a thing! They were so good. Those pictures just made me crave donuts! If the roads were so bad, I’d drag myself out just for donuts! Can’t go get doughnuts? Just make them at home 🙂 That is the danger of having all the ingredients in my pantry.